One of the major changes we made to the site in 2011 was the introduction of the fantastic triVIEWER application. With our unparalleled archive of results going back well over a decade and more you can re-live races you might have even forgotten that you took part in! You can even pick events and watch specific athletes racing 'head to head' even if they started in different waves - this is, after all, a race simulation based on results so we can play with reality a bit! Where it really shines as a replay system, however, is in events that have a mix of pro athletes and age groupers and all go together and we had a perfect example this year with the XTERRA World Championships. Add a little spice to the mix like cycling legend Lance Armstrong making his multisport comeback and you just have to watch to see how the GB athletes fared. So, as a special treat, we have pruned down the data and focussed on Lance Armstrong vs. Sam Gardner and Richard Stannard. Well, we all know that the seven-time Tour de France winner can ride a bike and from the Leadville 100 mountain bike race we know he is pretty handy on a MTB bike too. 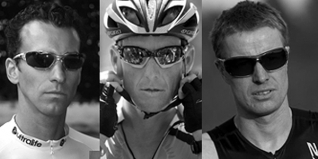 But, how would Lance Armstrong get on against some of the biggest names in triathlon at the 2011 XTERRA World Championships. Having finished fifth at the XTERRA USA Championship in Utah, Lance was ranked as a genuine contender in Maui. Great Britain's Richard Stannard is well-known for his fish-like swimming skills, and has recently directed his triathlon skills towards the off-road scene, where he won the 2011 British Cross Triathlon Championship. Sam Gardner, meanwhile, is not such a fish in the water ... but is easily Britain's most successful male XTERRA racer, with multiple victories in Guam, Saipan and Japan on his extensive XTERRA CV. Click on the screenshot to follow the race (or use this link). You can also view the detailed results HERE. Well, no surprise who out of these three was first out of the water. Richard Stannard has a vast number of swim titles and scalps to his name, though his 20:22 swim split brought him out of the ocean just 37 seconds clear of the cycling legend. Sam was almost five minutes in arrears to Richard at this stage. Make no mistake, Lance can swim. The fastest bike of the day was from the overall winner Michael Weiss who charged around in 1:17:30. Having been caught early on the bike Stannard biked hard to complete the course in 1:29:45 putting him behind Lance and Sam with an off-road run his only hope of pulling them back in. So he can swim and bike, but Lance Armstrong is a pretty good runner too - in 2007 he ran the New York City Marathon in a highly respectable 2:46:43. So, how would he get on over a very challenging 10km off-road run? Nobody in the field ran sub-40 minutes which shows just how tough the run was. Sam was able to catch and pass Lance with a 45:18 run split, to bring him home 11th and record his best ever XTERRA World Championship finish. Lance lost time on the run - following his big spill on the bike - his 52:40 time dropping him to 23rd overall at the finish line, while Richard's 49:01 run allowed him to regain some time on Lance, but not enough, finishing 33rd overall exactly four minutes behind the Texan. Britain's Lesley Paterson (46th overall) was the 2011 ladies XTERRA World Champion so none of the three boys got 'chicked' on this occasion...! Remember, wherever you see the triVIEWER icon in our results database, you can re-live your own race history. Have a play, and see what you can find. For more on triVIEWER, check out this guide.